A variety of harmful substances are found in our working environments and knowing how to handle these safely is key to safety and protection from injury. With photographic illustrations, this poster shows the Do’s and Don’ts when handling chemicals. It also clearly presents the hazardous signs found on chemical containers. Text is minimal, but highlights how to safely store chemicals, how to use chemicals safely and how to protect chemicals from vulnerable people. 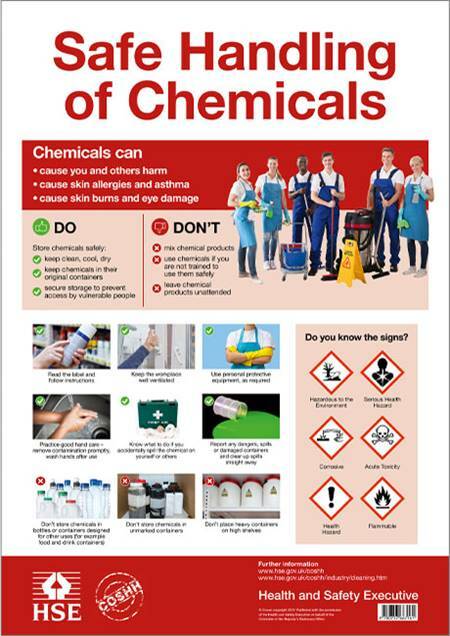 This bright attractive poster is essential guidance in your workplace to highlight how to handle chemicals safely.